Since winter nip is in the air, I've taken to wearing tights a lot in order to continue getting away with my dresses and skirts. These cheerful, mint tights nabbed my eye while browsing through Target, and I had to test them out. This color is just so appealing! Especially when mixed with black accents. 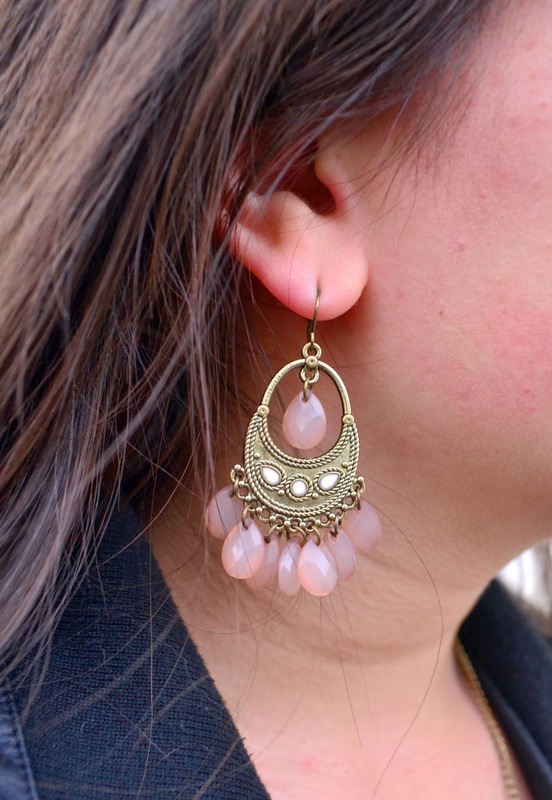 These jewels are from Born Pretty, and I love the edgy yet bohemian feel to both. The spiked necklace makes the perfect statment, and the earrings have a pretty feel to them. I've got a couple more pieces from Born Pretty that I'm excited to show you! They have some fantastic options to choose from. With holiday spirit in the air, I've been soaking in the simple things that make this time of year so enjoyable. Cozy clothes, layering, hot drinks, lazy days inside, hours of TV shows....the works. Haha, when I have time at least! Corina and I stumbled across a new treasure of a TV show, Revenge! Oh man, we're obsessed. When we start one episode, we can't stop and end up watching about five. When they're approximately 45 minutes each, that adds up to a large chunk of time. So being productive is not a big priority right now. The holidays cause an increase in laziness! With the end of the semester nearing, it's getting difficult to stay focused. Who else can't believe it's already December? Craziness! Excellent layering Linda! I love mint and glad to see it incorporated into your Winter wardrobe. Very pretty. its the daylight savings time madness. What a cute look today, I love the mint accents and the necklace is pretty adorable, too! I also can't believe it's December - this year just flew by! The tights look awesome- so cool as an extra layer to the Look. Maybe I should give coloured legs a go? Cool houndstooth skirt and the tights look good on you. haha i like the title of this post.. it's very you. anyway love your skirt Linda! so pretty! and Revenge? how is that? never heard of it before but now that you talk about it, i think i should check it out. am looking for a new tv series to follow. Love your necklace! Love your outfit! You look genius! Thanks for your sharing! Aw yess, tights are super important for the winter times! I'm pretty pumped that I can wear them around now. Especially the bright ones... makes it exciting, doesn't it? I really love these aqua ones, Linda! You should wear them tons so I can steals your funky outfits. ;D They look absolutely dashing on you! I seriously didn't realize it was December until I was writing a blog post and looked at the time stamp! Crazy! Yep, holiday relaxation mode has kicked in for me too. Which is bad, because I still have a ton left to do before Christmas!! LOVE the penultimate picture here. It's a perfect shot! Great shirt, and great graphics too. I'm really loving the titled images in the beginning of each post. Looks so well put together. Because it is! Ha. Love your skirt and it looks amazing with green. P.S. : I LOVE this look, mint's one of my favorite colors, you look great, babe!!! I like the leggings and skirt combination! Love those minty tights! Tights are the perfect thing for winter. this outfit is slightly different style than ones you've posted and it's so much fun, love the mix of colors and prints here! Hi Linda, we definitely share the same taste in TV shows, Revenge is one of my favorites, its riveting and keeps you at the edge of your seat. Are you team Daniel, Jack or Aiden? Love the way you mixed it up in this fine outfit, the tights are the prettiest shade. You are so kind to visit, hope your week in going wonderfully. 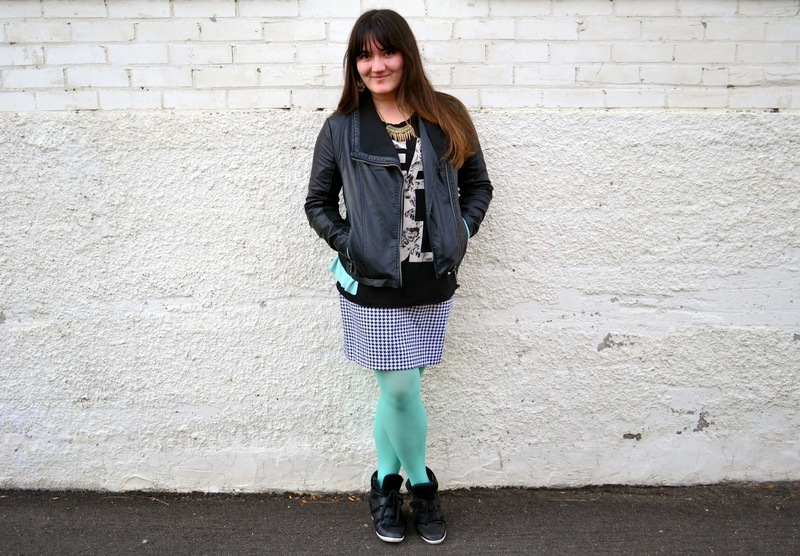 The mint tights are so sweet <3 I wearing also tights for this winter. i really LOVE the mint color!! it's perfect for that winter Christmas feel!! i like how you incorporated houndstooth print to your ensemble!!! Chic Linda! !